Eighteen-time Isle of Man TT winner Michael Dunlop says he is determined to achieve more successes at road racing's premier meeting this year. 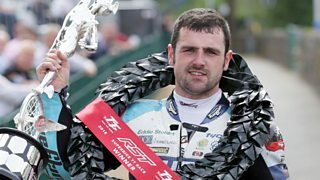 Dunlop says he has achieved a lot of his goals but never "reached out to get them" because the world of TT road racing is a ruthless sport. The Tyco BMW rider also says he wasn't surprised the 135mph lap barrier was broken at last year's event and believes it will "get faster and faster again."